By Rachel Held Evans, on November 03, 2012. I remember her hands the most. Her knuckles and joints were knotted and twisted, bent from years of painful arthritis. But that’s not why I remember them. I recall the way she decorated her fingers with rings, clunky costume jewelry sparkling with fake diamonds, silver rings with clasps that opened secret compartments where she joked she kept her poison. She walked to the sound of clinking bracelets and the soft metallic tapping of long gold necklaces against one other. In my mind, I can follow her jeweled hands as they help her tell her stories, comb through her short silver hair, adjust the large cross around her neck, tap the crook of her curved nose, brush a canvas. 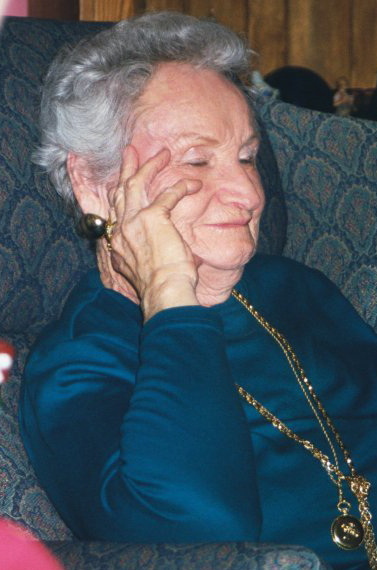 In her stories, she was born in 1915 in Texas and by the age of thirty, she was still unmarried. She considered herself an old maid, working at the post office and still living at home. When the old boyfriend she hadn’t seen since high school returned from three years in a Japanese prison camp during World War II, she married him. They both lived to their nineties, still married. Because he was in the military, they moved over thirty times in the course of their marriage and the stubbornness that kept them together also brought periods of discontent. She told me that she’d always wished she’d done more with her life. I couldn’t imagine that because her love and creativity filled my own life. When I was in middle school, she took me to an art museum for the first time. I discovered a new kind of beauty that day, at that Degas exhibit. And years later, as I studied literature, creative writing and theology, I would think about those Impressionists, wondering at the purpose and voice of art in the world of God. As I did my own writing, I would also think about her stories, the humor and self-deprecation with which she weaved her life with those in her past. When she was in her sixties, she began to paint. Her canvases were precious possessions to her family: oil paintings of Degas’ ballerinas, sketches of an old tree swing in the backyard, of still life and country life. In their tiny backyard, she turned a boring wooden fence into a backdrop for vines and flowers, trellises and lattices. Her room was decorated with books: Jane Austen novels and Cadfael mysteries that she would stay up late into the night reading. Perhaps she lived what some would call a small life. She wasn’t a doctor or a lawyer or a businesswoman. She didn’t give her life to prestigious causes. But to me, she was a woman of courage, feistiness, beauty and strength. She was a political liberal among conservatives. She encouraged me to travel on my own and explore the world, to wait to get married like she did. I remember her fingers with rings and jewelry, her paintings, her garden and her books because they remind me of the beauty she added to the world. From the seemingly small spaces she inhabited, she taught me that God was grand and beautiful and that art had a way of expanding our imaginations so that they could open up to the feeling of a limitless God. My grandmother was an artist without fame, a chronicler of the details of life that make us all human. She was fierce in her love for God, for her family and for inhabiting the beauty of creation. I’d like to think that whenever any of my guests admire her ballerina painting that hangs on my living room wall, a little more of God’s beauty is glimpsed and creation expands in grace. Christiana spent her childhood in Texas but after college, she lived for four years in Scotland, studying theology and writing. She writes, preserves food and cares for her two young children in a Mennonite farming community where she lives with her husband. She blogs at The Beauty of This Hour. This post is part of our Women of Valor series. Eshet chayil—woman of valor— has long been a blessing of praise in the Jewish community. Husbands often sing the line from Proverbs 31 to their wives at Sabbath meals. Women cheer one another on through accomplishments in homemaking, career, education, parenting, and justice by shouting a hearty “eshet chayil!” after each milestone. Great women of the faith, like Sarah and Ruth and Deborah, are identified as women of valor. One of my goals after completing my year of biblical womanhood was to “take back” Proverbs 31 as a blessing, not a to-do list, by identifying and celebrating women of valor. To help me in this, you submitted nearly 100 essays to our Women of Valor essay contest. There were so many essays that made me laugh, cry, and think I’ve decided that, in addition to the eight winners we featured in August, I will select several more to feature as guest posts throughout the fall. We have honored a single mom, a feisty professor, a midwife, a foster parent, an abuse survivor, a brave grandmother, a master seamstress, a young Ugandan woman who reached out to a sister in need, and many more. Read the rest of the Women of Valor series here.